“We are here to remember the thousands who lost their lives in the genocide…We are here to tell the families and friends of the victims that we share their sorrow. May their souls rest in peace, said Mr. Ban in his remarks to the special event, which honours the 8,000 men and boys who were killed by Bosnian Serb forces who overran Srebrenica – the largest such massacre on European soil since the founding of the United Nations. Organized by the Preparatory Committee for the Commemoration of the Twentieth Anniversary of the Srebrenica genocide, which is made of 17 UN Member States, as well as the Permanent Mission to the UN of Bosnia and Herzegovina, the ceremony, was also attended by Sam Kutesa, President of the General Assembly. Mr. Ban said that the United Nations, “which was founded to prevent such crimes from recurring”, “failed in its responsibilities” to protect the lives of innocent civilians seeking protection from the conflict and violence around them. The UN Secretariat, the Security Council and Member States share the blame, he emphasized. “Here today, I again extend my deepest sympathies to the families of the victims. I renew my pledge to work harder and harder, every single day, to safeguard people everywhere from assaults on their dignity and security,” the Secretary-General stressed. At the same time, while there, he also witnessed “how far” Bosnia and Herzegovina has come since the “dark days” of Srebrenica. “I learned about the ways the country's varied communities are striving to build bridges, increase trust and lay the groundwork for full reconciliation. It takes a long time to heal such deep wounds, and the United Nations remains strongly committed to supporting these efforts. To build a common future, the past has to be frankly addressed and assessed,” he advised. In the two decades since the genocide, the UN had taken many steps to fulfil this fundamental obligation “to learn from the massacre”, by strengthening its work for prevention, Mr. Ban continued. Hi Special Advisers on the Prevention of Genocide and on the Responsibility to Protect provide early warning and work closely with UN Member States to build their capacity to protect people from atrocity crimes, while his Special Advisers on Sexual Violence in Armed conflict and on Children in Armed Conflict are also making important contributions, he pointed out. Flagging the Convention on the Prevention and Punishment of the Crime of Genocide an “important international instrument”, the Assembly President Sam Kutesa called upon Member States that had not yet ratified or acceded to it to do so. He said that it is of critical importance that the international community, particularly the United Nations, is equipped to recognize early warning signs, in order to detect and deter situations that could result in genocide of other gross violations of human rights. The Secretary-General also observed that the UN is promoting “truth-seeking” while upholding the principle of individual criminal accountability through the work of fact-finding and commissions of inquiry and the International Criminal Court, tribunals and other judicial bodies. “The perpetrators of such heinous crimes must not enjoy impunity,” Mr. Ban said. Saying that more can always be done, he acknowledged that the international community is still failing too many people in desperate need, from Syria to South Sudan, with “unspeakable” levels of violence and terror. “We must stand together against those who incite and divide – and those guilty of repression and misrule. Let us not turn our backs when people turn to us for help. This should be our promise to the victims of Srebrenica: to make right what was done wrong. A responsibility which falls on all of us,” the UN chief stated in conclusion. 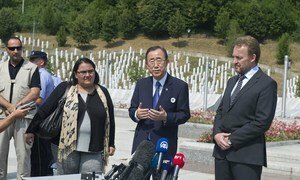 Secretary-General Ban Ki-moon today paid his respects to the victims of Srebrenica and called on the world to learn the lessons from the 1995 massacre and stop the ongoing bloodshed in Syria.